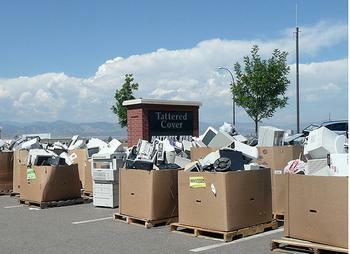 DENVER, Colorado, September 16, 2011 (ENS) – In the first case where criminal charges have been brought against an electronic-waste exporter, the federal government today charged two executives of Executive Recycling Inc., a Denver, Colorado electronics recycling firm, with multiple crimes. Executive Recycling CEO Brandon Richter and Tor Olson, vice president of operations, were indicted on 16 counts, including wire and mail fraud, environmental crimes, exportation contrary to law, and destruction, alteration, or falsification of records. After 30 months of investigations, the U.S. Immigration and Customs Enforcement’s Homeland Security Investigations team and a team from the U.S. EPA Criminal Investigation Division laid charges today. In 2007 and 2008, BAN volunteers photographed 21 sea-going containers at Executive Recycling’s loading docks that they tracked across the world, with most ending up in China. According to the federal grand jury indictment, Executive Recycling was responsible for at least 300 such exports, including shipments of more than 100,000 toxic cathode ray tubes that netted the company $1.8 million. “This is a major victory for global environmental justice,” said BAN Executive Director Jim Puckett.